Quick search for properties in Lakeview. Click on the links below. Lakeview, especially within the Lake Shore Drive and Broadway Avenue corridors, consists of upscale condominiums and comparably higher-rent midrise apartments and lofts. Small businesses, boutiques, restaurants and community institutions are found along Broadway Avenue and North Halsted Street. 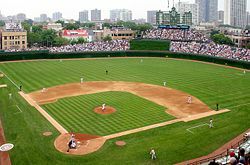 Formerly a working class neighborhood, Wrigleyville is the neighborhood directly surrounding Wrigley Field along North Clark and West Addison Streets. Actual boundaries are undefined, with some sources citing Wrigleyville as spilling into adjacent enclaves like Lake View East and Northalsted. Wrigleyville features low-rise brick buildings and houses, some with rooftop bleachers colloquially called Wrigley Rooftops where people can purchase seats to watch baseball games without having to pay Major League Baseball ticket prices. Proprietors are able to do so under special agreements with the Chicago Cubs organization.